Some people get thrills from cliff-jumping or parachuting or crossing swaying rope bridges over a gorge of death-churning water. Me? I got those little bolts of excitement jumping down my spine the other day as I sat clicking through Cooks.com. Me? I didn’t need a can of crushed pineapple. Sitting on my kitchen counter, their spiky yellow skins bursting with fragrance, was not one…not two, but THREE gigantic pineapples, all fatter and taller than I could grasp with a single hand. A can indeed! Take that, oh so-called “tropical” recipes! Despite how commonplace they are in this country, I still am in awe that they exist…and even more, that they are sitting on my counter. After all, the place that I call home resides in the northernmost US state of the Lower 48. We’re the place that can get snow flurries in May and ice storms in September; where a native Minnesotan can read the temperature by how fast her eyelashes freeze or how long it takes for her hair-icicles to melt rivulets down her back while sitting in church. We have dairy cows and pine trees, prairies and apples…but every pineapple we taste is tossed and bruised in plastic bins, shipped across the country, slapped with a price tag that makes fruit aficionados cringe, and arriving on our doorstep in a pale sort of yellow that reminds me of babies with jaundice. But here, I scour libraries and databases for recipes that feature the pineapple more prominently than just a cute little ring in a fruit platter. Why? Because I have my very own pineapple patch in my backyard. Oh yes, be jealous. Be very jealous. It’s enough to give anyone an adrenalin rush! Before coming to PNG, I never dreamed of pineapples in my backyard. What are some favorite things that you have encountered in your back lawn? The padlock had fallen into pieces again. I rammed it against the fence, forcing it back together before deftly slinging the rest of the chain around the gate and fastening it tight. I turned to walk down the hill toward my house, then stopped and looked back. My Abba is so good. So good. I shook my head. In a strange mixture of Tok Pisin and English, I had just discussed the potential for skin melanomas to occur in gray horses and how that was related to the benign lesions currently afflicting Misty, a sweet gray mare. Once every couple of months, the “local” vet makes the grueling multi-hour journey from Lae to treat, fix, and otherwise consult on behalf of the menagerie of Ukarumpa animal enthusiasts—and today, one of his patients came from our herd of eleven horses. My flexible schedule and equestrian background had elected me the representative to discuss the problem, and now that the consultation was finished, it was time for me to lock the barn up. I shifted my bilum (string bag) to my head and straightened my laplap (wraparound skirt). This was a far cry from where I had imagined myself ten years previously. MN winters didn't stop me! As a child growing up on a farm, horses were my life. Rain, snow, mud—it didn’t matter. 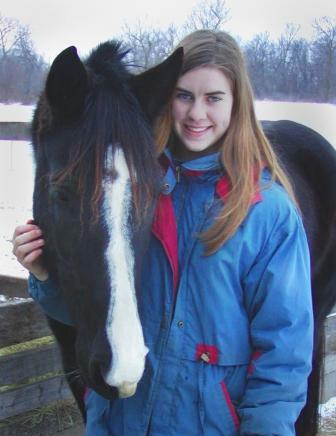 Between the time I was ten years old and leaving for college, the only time I went longer than two weeks without sitting on a horse was when I broke my ankle and the cast got in the way. I was, to put it plainly, horse-crazy. I threw hundreds (thousands?) of hay bales, built fences when my snot froze in the cold, and stayed up late to watch an ornery mare give birth. I analyzed films of top riders, clung to crazy green Wild Things, and discussed feed percentages in relation to performance. I researched training methods, scrubbed through horse shows, and agonized over saddle fit. Every summer of high school was spent working at a horse camp, teaching kids how to ride and honing my barn management skills under a paper thin budget. I fell off. I got back on. I shoveled manure for lessons, memorized vet books, and could recite breed characteristics faster than an auctioneer. I wrote long emails analyzing my leg yield challenges, scoured online bulletin boards, pondered genetics, and even changed the way I walked and stood—to be a top rider meant fitness off the horse too. Slowly, I improved, and my mare and I began to sand off our rough edges. I wasn’t overly vocal about it—but why should I be? It settled in my lungs every time I inhaled. How could life be any different than this? I dreamed of the day I would be able to ride my mare in Grand Prix dressage, and I promised myself vehemently that I would never be like one of them. Them. One of those people who chose to walk away from barns and sweat stains and the breath of your best friend on your shoulder. I could never do that. Never. And then, my freshman year of college arrived. October. And I realized that something else also breathed inside of me. Bible translation. But I had never heard of a Bible translator riding half passes and one-tempis at Grand Prix. But, obedience flows deeper than longing. And love lets us make sacrifices. So, with a military-straight back and Sunday School words throbbing in my head: all things work together for the good of those who love Him… I walked away. Don’t look back. Don’t. Look. Back. I knew I would need to sever any and all ties to the equine world—leaving even a shred behind would be enough, I knew, to scream stay! And, I was afraid I would—afraid in the manner that a chain smoker, desperate to quit, fears even the Marlboro billboard. 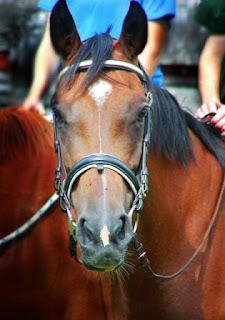 My mare sold while I attended linguistic summer school in a different state. I gave my horse books to my sister, packed my breeches into the uppermost reaches of my closet. And I pretended. My heart fought, of course. And so I slapped down further restrictions—if I couldn’t look at pastures without tears, then I certainly wouldn’t visit mine (and didn’t for over a year). 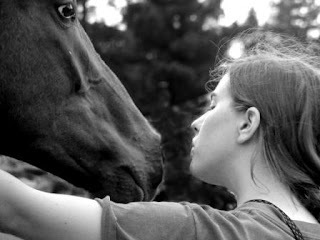 My sister continued down the path of riding, training and burying her hands in horses’ mane. I listened politely, detached myself even from jealousy… but I never visited the barn. I gave lessons occasionally, but each time I battered my heart against future hope, fencing it around with fear, inadequacy, and failure until even the most kindly-meant offer for me to ride caused me to shake uncontrollably and I could feel vomit rising in my stomach. And then, I found I was going to PNG. “You know, they have horses there,” someone whispered to me once. My back stiffened. Don’t you dare do this to me, God! Don’t you DARE put me through that again! I walked away once for you. I can’t do it again. So I kept pretending. I poured myself into partnership development, into linguistic school, and finally a ticket, an airplane ride and suddenly I was touching down in a tropical country where there certainly wouldn’t be piaffes or Myler bits. “And that’s the Pony Club.” My tour guide pointed out the window, where bays, chestnuts, and grays were meandering through the kunai grass. “They’ll all be there on Thursday.” Tomorrow. I’m just going to look, I told myself. Just look. I absently rubbed some of the green horse slobber off my tank top, and watched as the evening glinted off the backs of the grazing chestnuts. I don’t know where this next episode of my life might lead. After all, helicopter allocations are not accessible by horseback. Whether I ever get to don a shadbelly and tails or if I will merely soak a few liters of copra for a friend is beyond my understanding—and part of me no longer needs to. But I choose to hold my hands outstretched, cupped, open, and waiting. Because our Father likes to give good gifts to his children that are beyond all imagining. And that’s why last Thursday, I got to talk to the vet about skin pigmentation and photosensitivity in gray horses. “Miss Catherine! Miss Catherine! Is this toad poisonous?” The eight-year-old boy raced up the creek and thrust his discovery into my face, the placid amphibian sprawled limply in his hands. It was Wednesday afternoon, and the POC school kids and I had wandered down to the creek for an afternoon of mud fights and tadpole collecting. Although my job at the Pacific Orientation Course (POC) this past January-through-March was focused on educating the adults in Tok Pisin and PNG culture, when my housemate and friend who happened to be the schoolteacher needed to make an unexpected trip back to the States, I volunteered to step in for the last few days. After all, I told myself, it was only one week. How difficult could corralling ten 1st-4th grade children (nine of which were boys) be? The children built mazes out of dominos for their pet geckos and tried to teach them how to fly in their paper airplane wars; I doled out the morning snack (and answered complaints with, life isn’t fair). We had earthquake drills (a 6.7 magnitude hit Ukarumpa, and we felt it in Madang! ), wrestling matches (take it outside!) and every running game and tag variation I could think of (always less successful than I hoped in wearing them out…). We read aloud about giants (thanks, The BFG), solved mysteries with Encyclopedia Brown and discussed the important difference between area and perimeter. There were the spelling tests, the tears, the phonics worksheets, the band-aids, and the craft sessions in which glue bottles erupted like Mt Vesuvius until they pooled in the construction paper, defying all my attempts to dry their paper pukpuks (crocodiles) in the humidity. And who could forget the morning when one boy looped meters and meters of paper leis around neck and arms, and went dancing and hollering around the schoolroom in his best tribal shout? Insanity is too mild of a word, I decided. One afternoon, for their final craft project, the kids were to make signs to thank their wasfemilis (host families). After they copied down the phrase I had written on the blackboard, I told them they could now decorate the signs with pictures or drawings or further messages. What I neglected to remember was their current all-encompassing obsession: Star Wars. Faster than a gecko could have skittered across the ceiling, their posters were sporting lightsabers, ewoks, droids, and X-Wing fighters. “Stop!” I shouted, “No more Star Wars! Draw something else, but not Star Wars.” They looked at me blankly. What else was there in the world except Star Wars? Nevertheless, they soon bent back over their papers, crayons in hand. Well, excuse me. These kids could put George Lucas to shame. “Enough! No more Star Wars, Clone Wars, or anything from outer space period! Your wasfemilis don’t know these movies.” With heavy sighs, the boys resigned themselves to this final directive from their dictator, grumbling at the injustice of it all. But, it didn’t take them long to recover. And as I made my last lap around the room, I heard rather suspicious sound effects coming from one corner—and sure enough, I watched as the six-year-old and his friends busied themselves with putting the finishing touches on their final thank-you sign additions: tanks, attack helicopters, missile launchers, and machine guns. I darted back to my desk in time to choke back the tsunami of laughter that threatened to overwhelm any sense of decorum I had left. I streaked the tears from my eyes and looked at the snowman mascot Jack sitting next to the pencil sharpener. One-room schoolhouse, anyone? Getting settled can take a while, but on Monday, I finally felt like I had the energy and creativity such that I could entertain some friends. “Why not come over for dinner?” I suggested, and the date was set. Little did I realize that my innocent suggestion was going to lead to an all-day affair in the kitchen! You don’t believe me? Here are 42 steps to a perfect dinner party! 1) Day before: Figure out what ingredients you already have (bread dough, strawberries, browned mince (ground beef), salad dressing, some vegetables) and which recipes make the most sense in light of your pantry (lasagna, salad, garlic bread, and strawberry shortcakes). 6) 8:00 am: Attempt to start the morning’s work… Work? What’s that? 12) 1 pm: Sit down and attempt to address the pile of emails in the inbox. 16) Wonder why the oven is not pre-heating. Discover the gas went out. 17) Try to change the gas can. Have much difficulty. Get a pliers. Continue to have lots of difficulty. Argue with God. Eventually get the gas to turn on. Praise God. 19) Realize you don’t have sour cream for the shortcake dough. Discover that yogurt + baking soda is a substitute. Be really glad for yogurt. 20) 4:15 pm: Put bread in the oven. 21) Wonder why it is only reaching 250 degrees. 24) Remember that in the States you can buy pre-shredded cheese. Not here. Proceed to shred. 26) Check bread. It’s baking slowly. Temperature is too low. 27) Run outside and try to fix gas. 29) Start chopping vegetables for salad. 38) Run back and make whipped cream. Beat and beat and beat until soft peaks form. Long time. 39) 5:45 pm: Frantically wash more dishes. 40) 5:55 pm: Try to set the table and straighten the visible parts of the house. 42) 6:00 pm: Discover the napkins that you couldn’t find… and answer the door. Come in! Come in! I’m so glad to see you! Whew! Despite the oven’s best attempts to thwart my baking, all food turned out delicious and thoroughly cooked. Hooray! A perfect dinner party to conclude the day :-) And only 42 steps to get there!